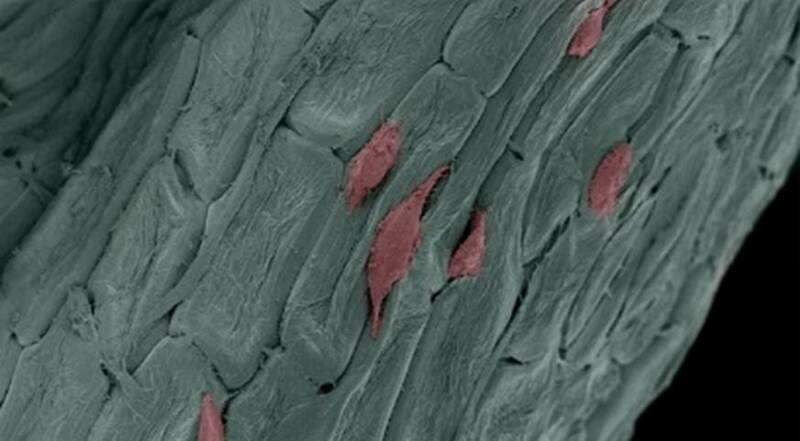 Human skin cells (pink) migrating upon a medical device (green) that was manufactured from a parsley leaf. Plant-derived devices are being developed into implants for surgical wound healing with help from the Forward BIO Institute. Image courtesy of Gianluca Fontana, UW–Madison. 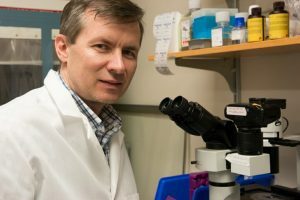 A series of projects aimed at advancing the human-health and economic impact of biomanufacturing is already benefiting from a new University of Wisconsin–Madison institute aimed at making the state a Midwestern hub of the ongoing merger of pharmaceuticals, medical devices and cutting-edge tissue engineering. The Forward BIO Institute, announced last month, intends to accelerate UW–Madison’s existing expertise in the next wave of biomedicine. William Murphy, a Biotechnology Training Program (BTP) mentor and professor of biomedical engineering and orthopedics at UW–Madison, directs the Institute. BTP mentor Sean Palecek. Photo by Andy Manis. Three associate directors have been named to the Institute. Sean Palecek, a professor of chemical and biological engineering, is director of research innovation. “Sean is a leader in biomanufacturing research who brings world-leading scientific insight in new technology development,” Murphy says. Christian Capitini, a professor of pediatrics, is director of clinical innovation. “Christian has been a pioneer in developing groundbreaking cell therapies to treat children with the most serious diseases. His breadth of experience and creative insights make him the ideal person to lead the Institute’s clinical innovation efforts,” Murphy says. Several projects at the front edge of medicine are now underway at the Institute. In all cases, Murphy says, the goal is not science so much as engineering: to create “disruptive technologies” with immediate relevance to patients, and to biohealth companies. BTP mentor Kris Saha at work at the Wisconsin Institute for Discovery. Photo by Andy Manis. 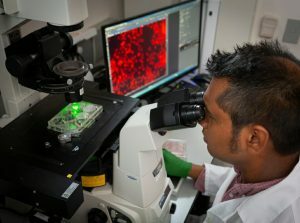 A technique to manufacture surgical dressing from plants, directed by UW–Madison pediatric surgeon Hau Le. The idea is to remove most of the plant components from leaves, leaving a fibrous structure that “turns out to be really favorable to promote wound healing,” says Murphy. In some cases, the structure will naturally biodegrade as the wound heals. Story by David Tenenbaum for the UW–Madison news site.